Ruinart, a premium brand of champagne, belongs to the LVMH Group. Further to 3D visualisations designed by the parent company, POP Solutions proposed a production line that was strictly identical to the imposed requirements. A blend of different materials; assembly of the display stand, preceded by a study to evaluate how the stand would withstand the weight when full; a perfect finish. 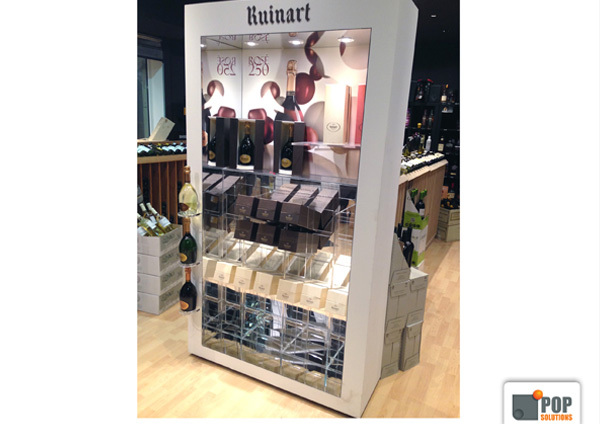 Design and installing of around twenty display stands in various wine cellars spread throughout Belgium. Production within a very short time frame in order to respect the client’s deadline requirements.